It has been shown in several recent photos, but I want to specifically mention my favorite track gauge. It is simply a flat standards gauge that has been glued to a 1/4″ thick piece of wood that allows the gauge to remain vertical while able to slide along the rails. 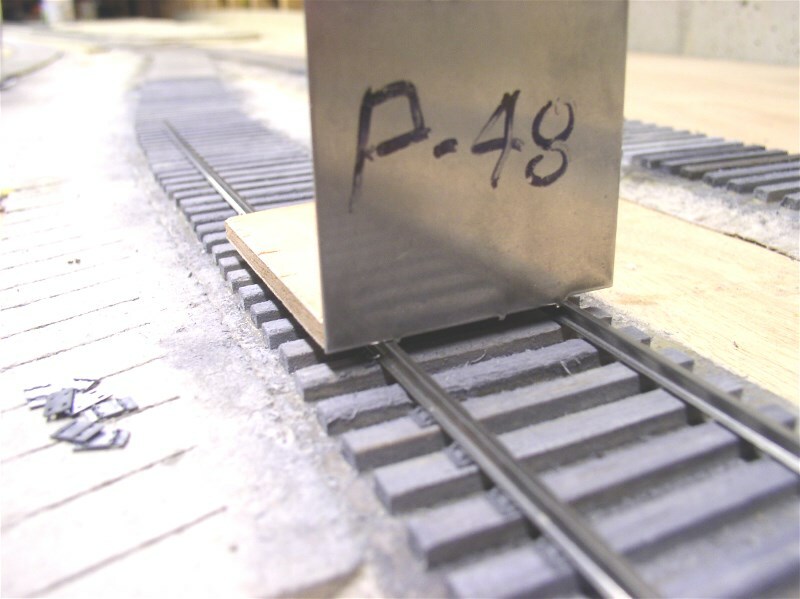 This is my first experience with P48 track, but in reality, it is no different in technique than laying my former railroad with its 1 1/4″ gauge. Some of its benefits are obvious, but the best is that it is always visible and ready as I work along. I should mention that if you are laying straight stretches of track, then it is better to use a combination of straight edge and three point gauges. However, for the randomness of track of the Eastport Branch the effect comes naturally. One detriment to this method is when building switches occasionally the little nib used for ON3 track spacing gets in the way. Usually I work around it, but if it gets bothersome, I will simply cut it off. I do keep a second flat gauge handy for checking guard rail clearances. It is easier than holding the wood block one vertical. If you wonder about the missing tie plates in the photo, my usual method is to spike one in place about every 6th tie and then go back and slide the others in place. One rail in the photo has plates in place without spikes and the other rail is yet to receive plates. There are also a few places in Calais Yard that will be buried partially and will receive no tie plates. I love the detail, but I’m not nuts to put it where it will never be seen. The chosen height of a layout can be a subjective thing. In my case it is very specific. Once a particular height is selected, then the design of the layout must be integrated with the height. 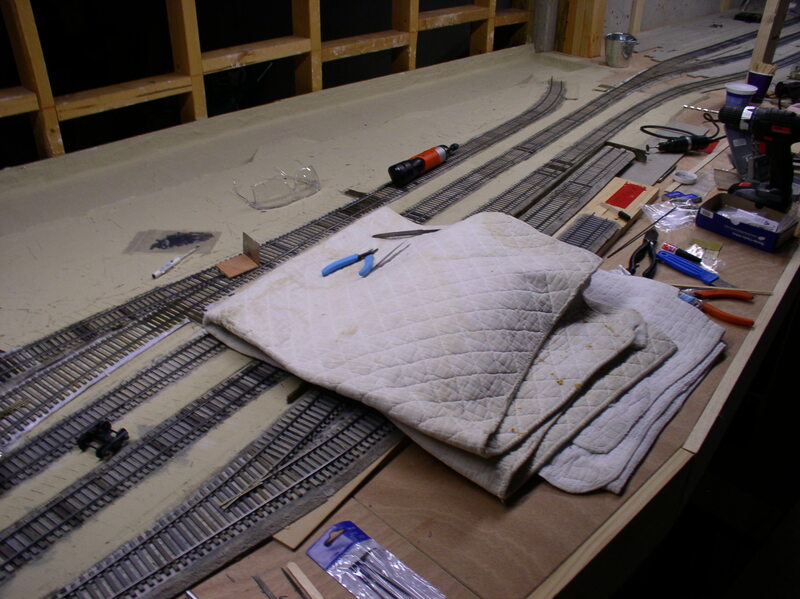 Common wisdom as decided by hobby gurus points toward a layout roughly belt buckle high. But because modeling in 1:48 brings out so much detail, I wanted to be able to see it. Therefore the rail height in Calais is 49 1/4″, which is smack in the middle of my chest. I am not a tall person and this decision posed a number of problems which needed to be solved in order to end up with a satisfactory operating railroad. These are the integration issues. There is a road in front of the Calais scene called Union Street. This road is vertically separated from the yard level to the point that the road will end up somewhere between 54 and 55″. 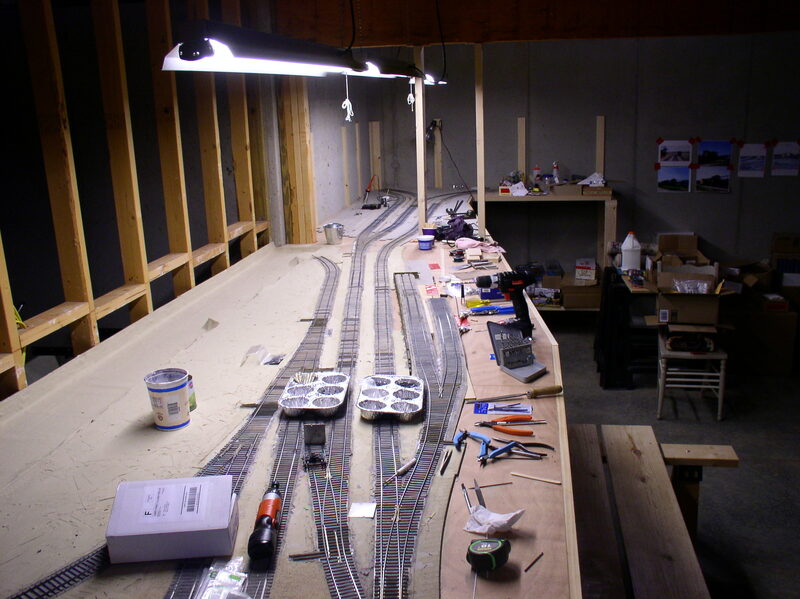 Picture a ridge running along the outer edge of the layout. The yard is approximately 40″ from the front edge. Conventional wisdom says working track should be no more that 30″ away in order to be able to uncouple cars and throw switches, assuming they are manual switch stands. This drives us to consider couplers and how they work. Although the standard is Kadee for reliable operation, they are almost impossible to separate using a pick or skewer at that distance, especially if one has bifocals. This sent me in search of a suitable coupler and ultimately I chose Protocraft magnetic style. After a lot of testing several things became apparent. First, they couple as well as the Kadee as long as they are centered. Second, there are no ugly and non-prototypical trip pins. This fact allows me to use my magnetic air hoses which adds a level of important detail. Third, just waving a magnet over the tops of the couplers will lift the locking pin. No contact is necessary. Several of the working switch stands will have to be driven by servos because they are out of reach. I enjoy the working stands, but I will have to choose which of those will be difficult to reach. I use DCC which allows me to address the servos directly. The top of the backdrop will be just over six feet. At the width of Calais, my field of view is the complete backdrop. The height of the backdrop is two feet which is a savings over wider ones. So, how do I deal with this unusual construction? Reaching of course is a problem, but really only during the construction phase. 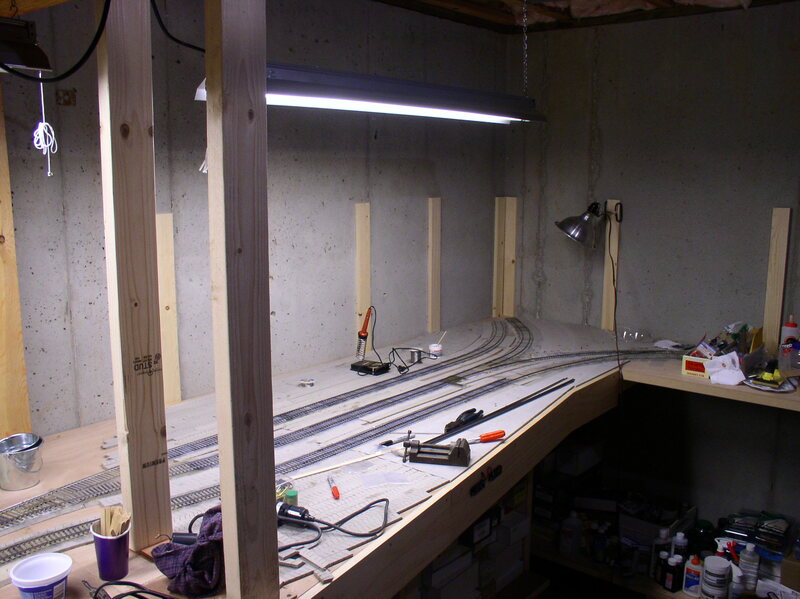 I built a staging bench that is 22″ high that I stand on while doing the track work. You can see it to the right in the above photo. It can also get a bit uncomfortable if I spend to much time in one position. To aid in spiking while reaching I simply use some padding to rest on which is made from folded mattress pads. You can see them in the photo below. Just easy solutions for use temporarily. To make my ideas work for the railroad that I want a bit of cleverness is required. Someone told me once that I was somewhat intense. Whatever it is, it certainly helps in the drive to succeed MEC style in 1:48. The track layout is pretty much representative of Ayers Junction. The junction is where the main line from Bangor (which is a branch itself) divides from the Eastport Branch. The wye to the left leads to St. Croix Junction and on to Calais. To the right leads to Eastport. The buildings I showed in the last posting will end up between the legs of the wye. Other than the buildings Ayers is pretty sparse, but that is the essence I hope to capture. When working in 1:48 coupled with a very small space, compromise is necessary. In building my representation of Calais Yard I quickly found the need for being flexible. Here’s the problem. The normal view of Calais Yard is from the US side looking across the St. Croix River at St. Stephen, New Brunswick. If one stands in St. Stephen, the yard is hard to see. There is a road closest to the yard where most photos are taken. It is called Union Street and is the same street the depot and freight house are located on which is along the west edge of the yard. Main Street is further back by one block and is also known as Route 1. At the throat end of the yard, Union Street joins and Rt. 1 curves toward St. Stephen and passes over the railroad. In some photos it looks like a small girder bridge, but in reality, it is a short tunnel. Normal rail traffic coming into Calais comes from the left, either from Bangor or from one of the upstream paper mills. The other end of Calais Yard is stub ended. In earlier years there was some local industry beyond the yard, but at the end of life, those tracks had been pulled back. 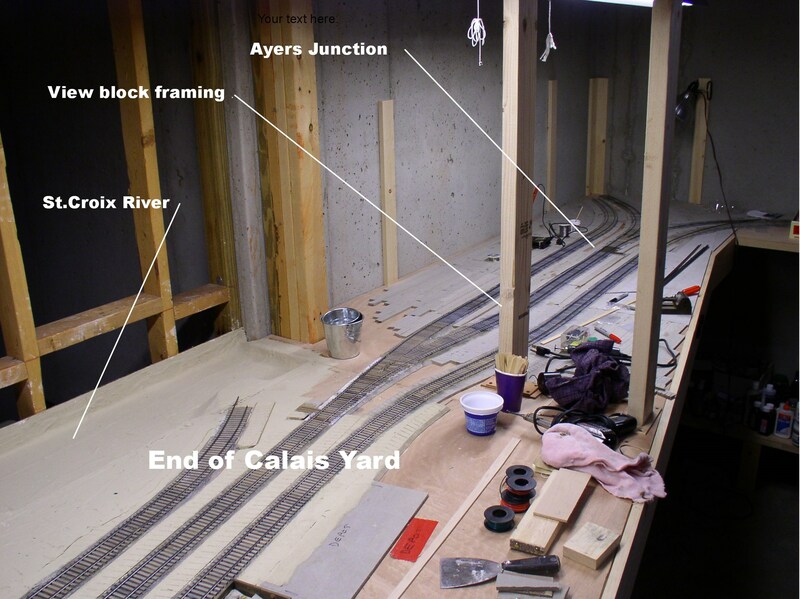 In constructing the model of Calais the dilemma is that it had to be built at one end of the U-shaped space I have. After a number of considerations it ended up on the left end. This meant that to make Calais somewhat operational, the traffic would have to exit from the stub end and the throat section would become the stub end. I have space for four signature scenes to make the model recognizable. They are, in order, moving left to right, Calais, Ayers Junction, Pennamaquan River crossing, and Eastport Yard plus harbor. Between Calais and Ayers I will need to build a divider wall to serve as a view block. There are two vertical studs in the foreground which will support the backdrop panel. I’m very pleased with the backdrop which Dave Burgess of Backdrop Junction made for me using some of my own photos of the area. It is 17 feet long and will be in back of the river and then curve outward to form the view block. On the Ayer’s side of the view block I plan to use lots of trees to shield the portal. On the Calais side, I’m not sure yet, but it may end up to be another building for the train to run behind. In summary, this is the choice I made to keep the Calais trackage recognizable as a model, yet fit operationally with the rest of the branch. The rest of the railroad will follow the normal direction of travel and view point. Any regrets ? There is one scene that if you have ever seen it, is where the rails follow the edge of Passamaquoddy Bay. The large ocean view dwarfs the train. The colors of the ocean and sky are unforgettable. Unfortunately it will have to live in memory. Even if I used all of my space on this one scene, it would not do it justice. Sometimes when a blog falls silent, it does not mean the owner has expired or given up the hobby. In my case I have been quite busy with track work. Most of the stock rails are down for Calais Yard and work has been started on the switches. The first switch took most of the day until I decided the parts and techniques I needed to use. Now that is behind me the work is proceeding much more efficiently. There is no getting around the fact that each tie receives two plates and four spikes. And there goes the time! Calais Yard, St. Croix River (tidal) to the left. In between track work and grandchildren’s school activities I have been getting a few important structures ready. 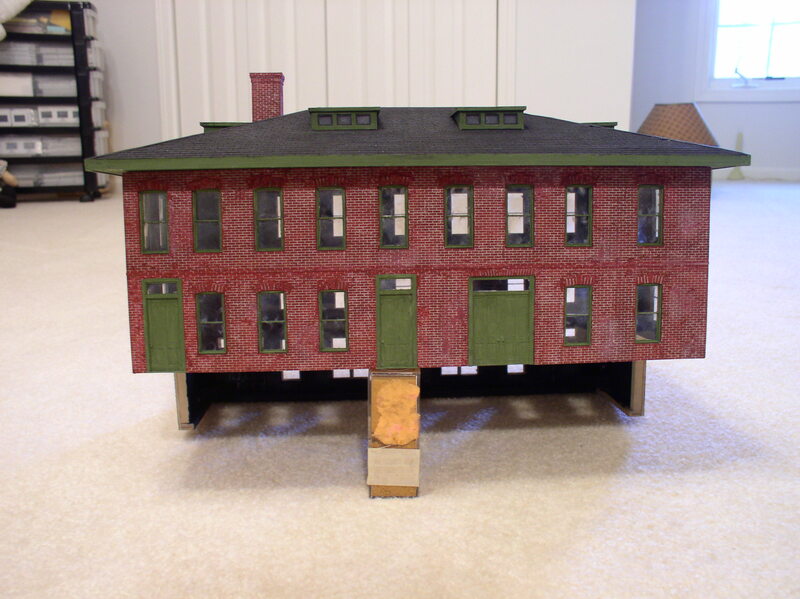 Prototype modeling requires attention to structures that will set the scene and make the railroad recognizable. For Calais, the depot and freight house are ready for placement to begin the foundation work. Both of these buildings are sited on a slope to the degree that the depot is two stories on the street side and three stories on the track side. I also have most of the engine house shell done, plus an Esso gas station of the older tile face kind. Ayers Junction has some relatively small basic structures that are mostly utility in nature. 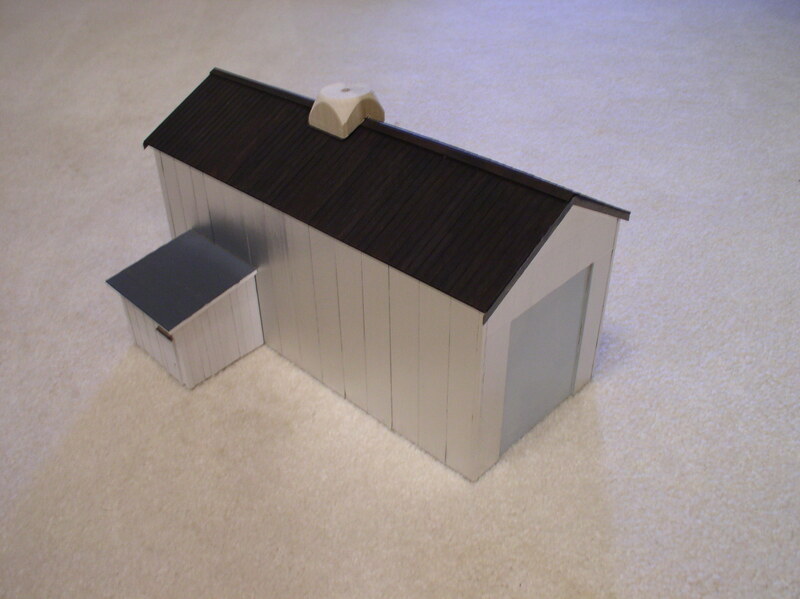 Painted in Maine Central colors they will help to set the scene realistically. 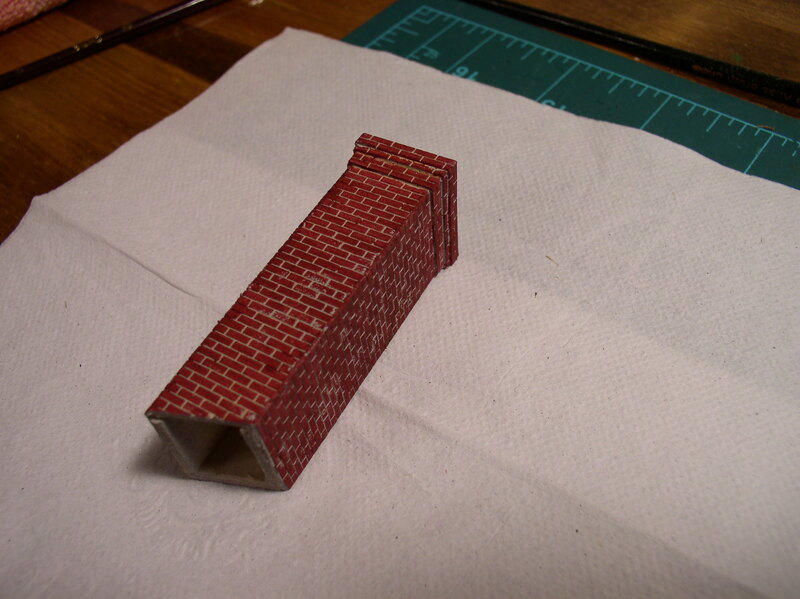 This post is for Bob, who asked for more detail about pad printing of brick on my Calais depot. I chose to picture only the chimney due to some size restrictions on my bench plus trying to take photos while working with acrylics which I definitely am not used to. In fact, I am having difficulty getting used to after so many years with Floquil. I think part of what I have observed is the Floquil covered much better due to their finer ground pigments. Acrylics seems to require two to three coats to get the coverage I got with one coat of Floquil. I am working with Rusty Stumps brick material which is very sharply cut and lends itself well to the idea of pad painting. The first step is to prime. I use a gray primer which also serves as the mortar color. If one wants a sharper contrast, then white primer could be used. 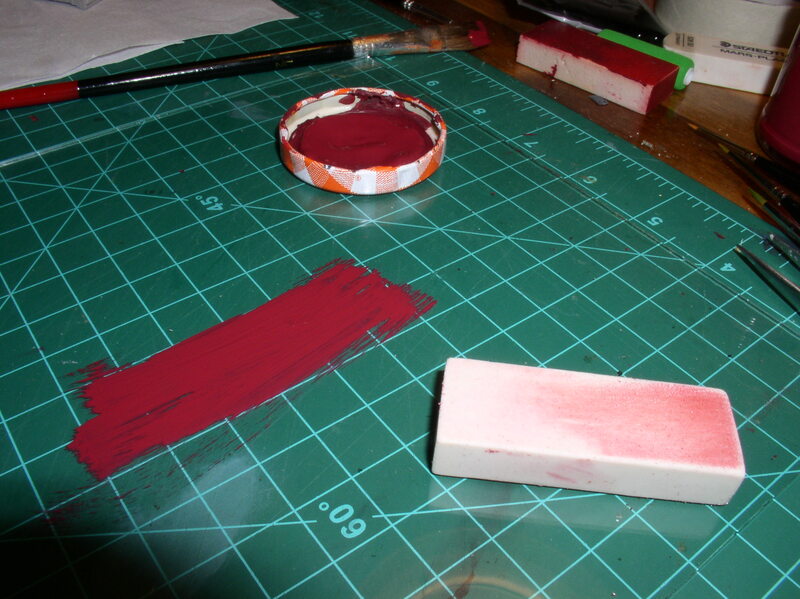 My tools consist of a glass plate on which to spread the brick color paint. I spread it out first with a wide brush and then place the eraser into the spread paint several times to even out the coating picked up by the eraser. Pad the eraser into the paint, avoiding the temptation to try and spread it with the eraser which will cause a buildup on the edge which into will transfer to the model as a blob. If you do get a buildup on the edge, then wipe it off before placing on the model. Once there has been a smooth coating made on the eraser surface, then the eraser is simply placed on the prime surface. The acrylic will not transfer evenly as does Floquil, so I have to move the eraser position and pad again, sometimes several times to get the paint opaque enough. The spread paint on the glass dries fairly quickly so I then add another brush load and spread that out near the first area of paint. It becomes pretty clear with the timing as to when the paint needs refreshing. 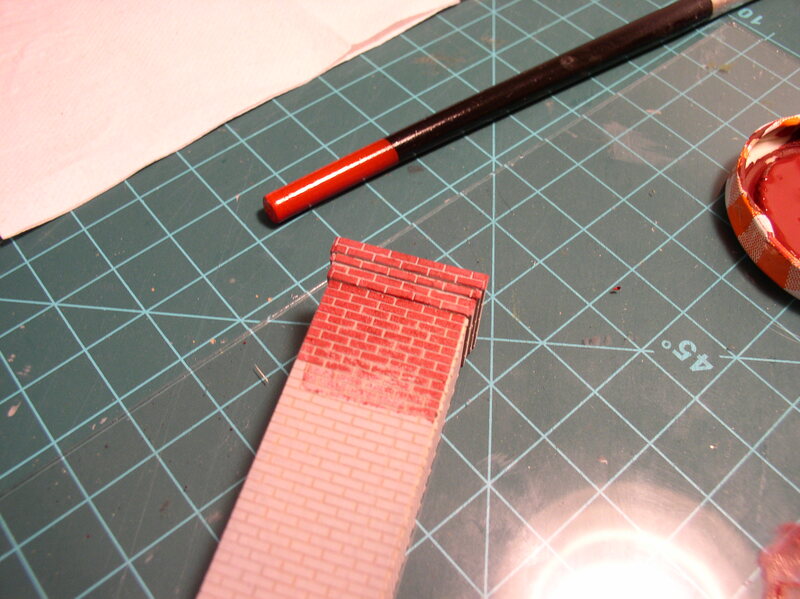 For reference, the chimney was padded only with the end of the eraser. That made it easier covering the raised detail around the chimney top. The above is what I would refer to as the raw brick finish. I intend to use washes and perhaps powders in the final weathering in order to blend the overall appearance. The eraser itself is some sort of plastic used in drafting. It removes pencil lead very cleanly. I have a box left over from my engineering days. It was made by Steadtler, but if you want to try this and good flat surface plastic or rubber eraser will do. It is more a matter of practice and getting used to than the actual eraser itself. 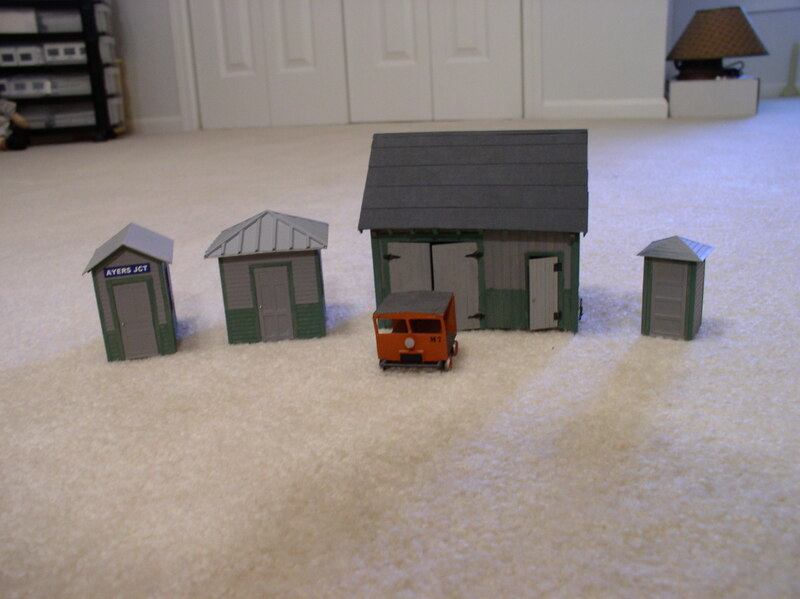 So far, I have completed painting the freight house and the depot chimney and am now working on the depot structure.